The village of Lăzarea located is 6 kms north of Gheorgheni, on the southern slope of the Szármány Mountain. The settlement was founded in the 12th-13th century. It probably got its name after the mountain which was originally called Szár (bald) Mountain. The existence of the village is closely linked with the Lázár noble family. Unlike a fort, which basically is a building strengthened with a system of fortifications with the purpose to serve as administrative and military headquarters, a castle is also seen as a big medieval building, equipped with towers and battlements, surrounded with walls and ditches yet served as the home of the senior, the feudal lord. As most of the castles in Transylvania or Europe, the building preceiding a castle was the keep or donjon. The construction of the keep in the case of the Lázár castle dates back to 1450. The Lázár Castle, located near the village center of Lăzarea is one of the finest examples of Renaissance architecture in Transylvania. The castle with battlements was one of the most attractive noble residences of the eighteenth century in Transylvania. In a hallway of a vault in crossarch, inscriptions in Gothic letters signal a phase of construction to 1532. The curtainwalls are equipped with four bastions. The entry into the castle courtyard is through the gate tower on the south side. 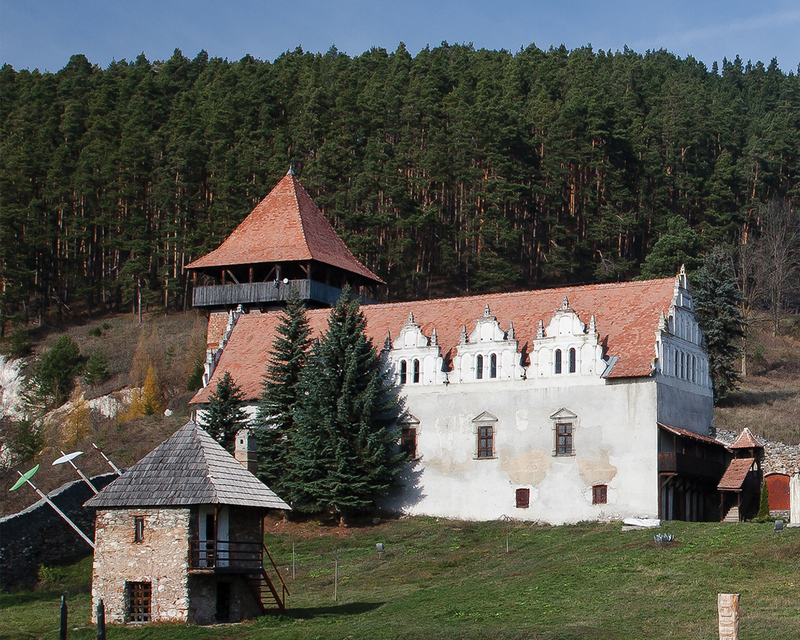 The castle and castle's façade, as we see it today, was built during the lifetime of István Lázár, the playmate of Gábor Bethlen in their childhood, later a man of trust to the prince of Trasylvania, and supreme judge to Giurgeu, Ciuc and Casin seats (chairs). The relief with the coat of arms dating back to 1632 inside the courtyard, marks the date of completion. In 1707, the castle was set on fire by the Habsburg forces, following a campaign of retaliation on the "Kuruc" revolutionary forces (opponents of the Habsburgs), as was the lord of the castle, Ferenc Lázár. His name is linked to the construction and reconstruction of the Hall of Knights. Among the prominent personalities who have had a prolonged stay in the castle we account Prince Gábor Bethlen, his mother being a Lázár-girl. Mihnea Vodă or Mihnea III of Wallachia was hidden in the castle Lázár for a year after being chased away by the Turks and Moldova's Petru Rareş, one of the founders of notable painted churches in today's Bucovina, spent here 11 years under the protection of the Lázár family between 1527-1538. Lázár Castle was repeatedly set on fire, the most disasturous one being the one in 1842. Since 1967 the castle is under constant renovation and restoration work that was halted a few years ago. The ultimate goal would be to give the former splendor of the building for the simple fact that it is one of the most important Renaissance buildings of Transylvania. In 2013 the eastate was returned to the descendants of the Lázár family, hence the fate of the castle is still undecided. The castle is under a padlock and, unfortunately, can not be visited.